Discover a more collaborative, real-time way to manage HR processes. Onboarding is the process of bringing a new employee into an organization, but effective onboarding programs go well beyond the first day of orientation. The process may actually begin during the recruitment and hiring stages. 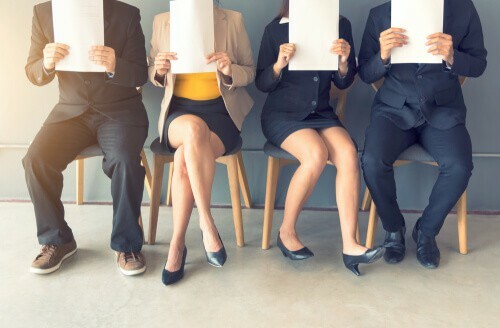 Sometimes called “pre-boarding,” this process can help prepare candidates for a job by providing information on company culture, values and goals, and time to complete some of the paperwork required for the position at an early stage. Automated HR systems can be especially helpful during this phase to deliver electronic documents, notify the IT department about what tools the new employee will need, and provide online multimedia information about the company’s leaders and culture. Onboarding can also ensure that proper training is being provided in order to reduce an employee’s learning curve and boost their confidence. Additionally, onboarding allows you to provide consistent customer satisfaction and ensure that there is no gap in the level of service being provided during an employee transition. In this article, you’ll learn more about the different types of onboarding and best practices, and find free downloadable Word and Excel onboarding templates and checklists. We’ve also included onboarding templates in Smartsheet, a work execution platform that empowers you to better manage HR processes with real-time collaboration and process automation. An onboarding program may last for several months or longer depending on the process. Guiding new employees through each step of the onboarding process can get them up to speed faster, ensure that appropriate goals are being assigned, help foster a sense of community and support, and increase productivity. Hiring and onboarding are two-way processes: businesses want to attract and keep top talent, and employees want to feel like their workplace is a good fit. Since onboarding programs are partly intended to increase employee satisfaction and thus reduce turnover - ultimately saving the company money - it can be useful to simply ask new employees how they like to be managed and identify their personal goals. This (in addition to social lunches and early appraisals) can help create a more individualized process for each employee. It also helps create a sense that the company is invested in its employees and wants to work with them. Compliance: Providing basic legal information and training on rules and regulations. Clarification: Clarifying roles and expectations for new employees. Culture: Introducing new employees to organizational norms. Connection: Helping new employees establish networks and relationships. Depending on the level of formality, some onboarding programs will only cover the compliance level, while others will include role clarification or other elements of the four C’s. The more levels that are included, the more effective an onboarding program is likely to be. Each level is an important aspect of helping employees assimilate and become effective contributors within an organization. Begin before the starting day: As mentioned above, consider recruitment and hiring as part of the onboarding process, and make sure that someone is available to answer any of the candidate’s questions. Even company branding can influence onboarding by presenting job applicants with a consistent message about what the company represents and the kind of work experience they can expect. HR processes: All employees need to be adequately informed about benefits, policies, and emergency procedures. They should be given security access if applicable, and any administrative procedures should be taken care of within the first week of employment. Get to know the office: Help acquaint new employees with the office layout on the first day. Include the broader company culture and goals, as well as informal social norms. Tools and equipment: Having this set up as early as possible will help get employees up to speed with fully functional workstations and mobile devices when they start on the first day. Build contacts: Welcoming a new employee includes meeting the team, setting up lunches from the first day, arranging meetings with relevant stakeholders, and generally building networks. Learn the job: Depending on the position, role requirements and expectations should be as explicit as possible. Having clarity can boost a new employee’s confidence and help them reach milestones sooner. Evaluation: Measure the employee’s onboarding experience by getting their feedback and assessing their performance during the program. This will help you determine the success of your onboarding process so that adjustments can be made as needed. Creating an onboarding checklist provides an outline to follow, ensuring that each stage of the program has been completed. Documenting the process minimizes the chance that something important will be missed, and ensures compliance with company procedures. To save you time, we’re offering multiple free onboarding templates, including checklists. These templates are customizable, so you can modify them to suit your planning or documentation needs. Smartsheet also offers an onboarding template with enhanced features like easy collaboration. 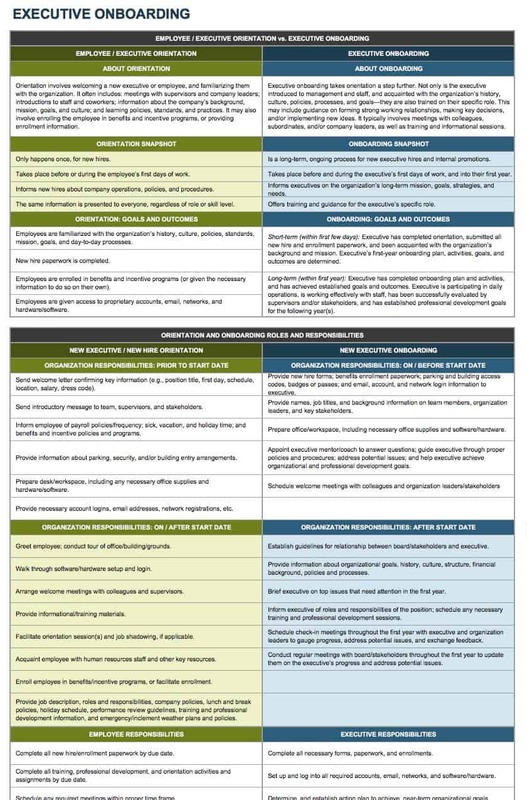 See the Smartsheet section below to explore template options. Use this new employee onboarding checklist to keep track of all of the documentation needed when new hires are starting out. List all new employees along with required paperwork, the location and status of the documents, due dates, and other information. 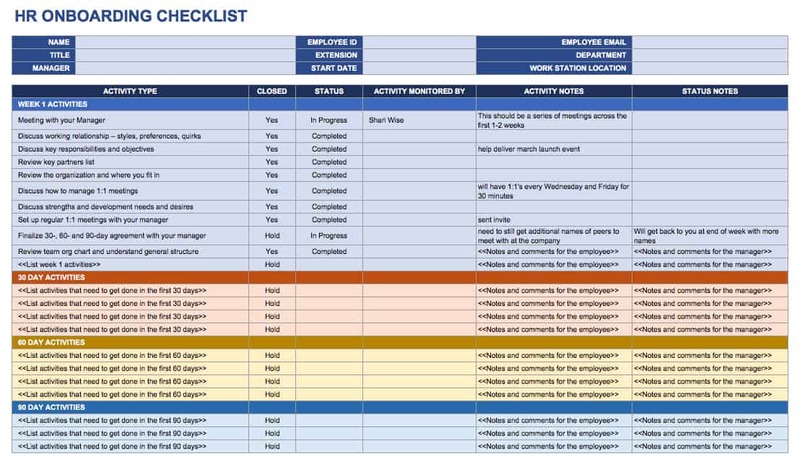 This template can serve as a tracking sheet and checklist to help human resource managers ensure that all documentation is accounted for when onboarding new employees.ced features like easy collaboration. 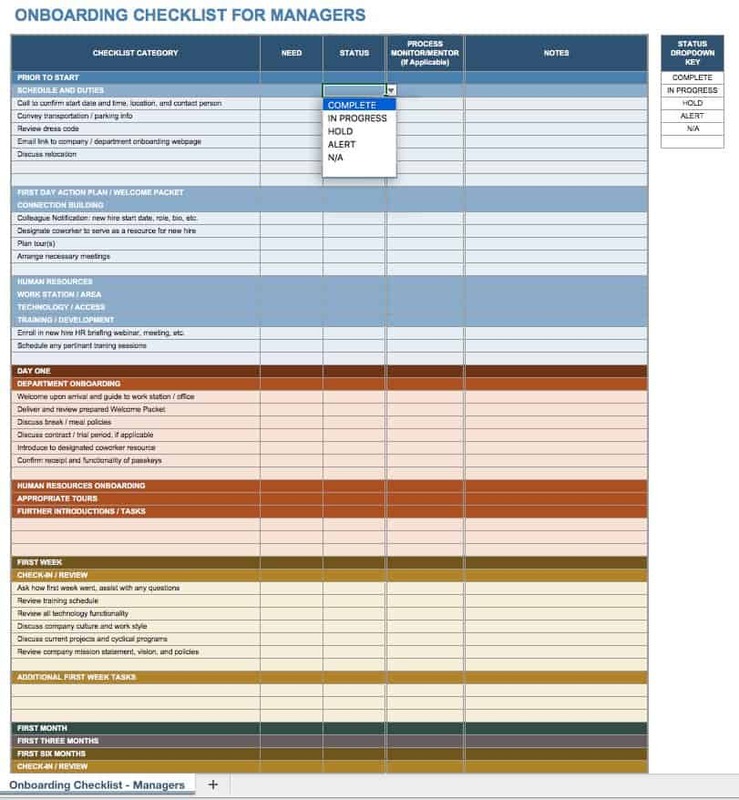 See the Smartsheet section below to explore template options. This human resources onboarding checklist provides an outline for each stage of an onboarding program. You can create an itemized list of activities, mark the status for each one, assign a contact person, and add additional notes. The checklist is preformatted for a 90-day onboarding process, but can easily be edited for any duration. 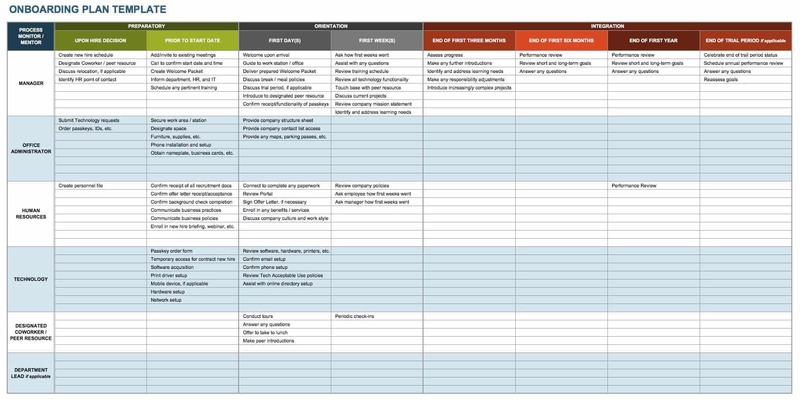 Use this template to plan what onboarding activities will be completed during each stage and by whom. Contacts - which may include an HR representative, the new hire’s manager, the IT department, a mentor, or others - are listed in the first column. The rest of the spreadsheet shows the onboarding tasks assigned to each contact over the course of a year. Add or remove columns as needed to create a comprehensive onboarding plan. 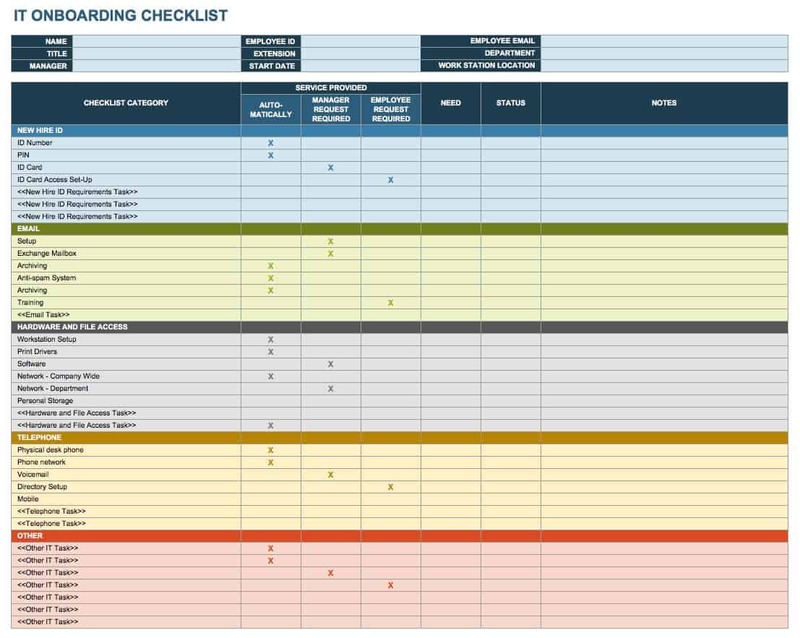 Managers can use this checklist template to make sure all bases have been covered for each stage of an onboarding program. A manager’s tasks are listed for pre-boarding new hires and working with them through the first few months of employment. The checklist covers typical onboarding responsibilities for managers, from introducing an employee to a workplace to providing performance evaluations and getting feedback. In some cases, it may be useful to have a separate information technology (IT) onboarding checklist to make sure new employees have been provided the proper devices, email service, security clearance, and access to internal systems. You can use this template to list the needed services and tools, the status for each item, and notes, which can be useful for communicating instructions to new hires or to an IT services department. This employee onboarding checklist template is specifically designed with developers in mind. It walks through the steps for onboarding new hires into a developer position, from the introductory period to assigning projects and reviewing the onboarding process. The template provides a basic outline that can be expanded to include whatever details are relevant to your workplace, the new employee, and the position being filled. 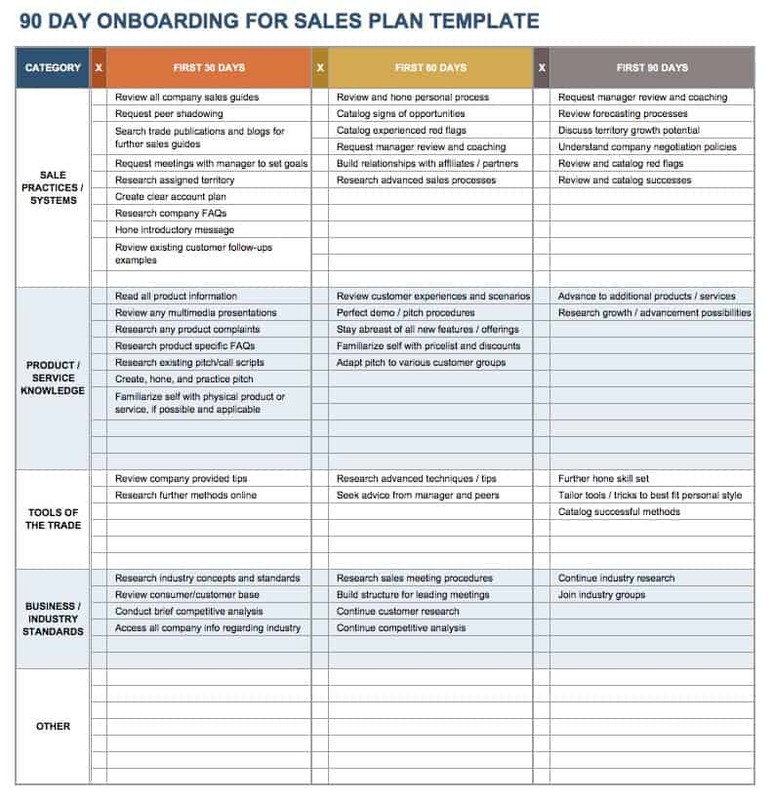 Create a 90-day onboarding plan for sales reps with this free template. Having a clear-cut plan can help salespeople quickly learn the processes and products that they’ll be working with and selling. Breaking the plan down into a three-month process can help ensure that appropriate goals are being set and met during each phase of onboarding. This onboarding schedule template combines a checklist with a calendar for planning and tracking onboarding activities. Simply list all the steps in your onboarding program and schedule them as needed for a new employee. This template is not only useful for planning, but also as a communication tool that can be shared with other departments and the new hire. Executive onboarding may be more involved and individualized than the process for new hourly employees. Because there can be a financial risk to an organization if the executive doesn’t work out, it’s imperative they are onboarded correctly. Plus, many executives are hired to make changes to a business rather than simply fit into the status quo, and the right onboarding process can help them hit the ground running. This executive onboarding template includes input from the executive in order to tailor the onboarding process based on his or her goals, skills, and identified areas for growth. A new employee orientation survey can provide useful insight on what aspects are working or not working in your existing process. Likewise, soliciting feedback on other stages of an onboarding program can help you finetune the process and reach your goals for productivity, performance, and employee retention. You can use this feedback form to find out which elements of orientation and onboarding were most engaging and effective for new employees. 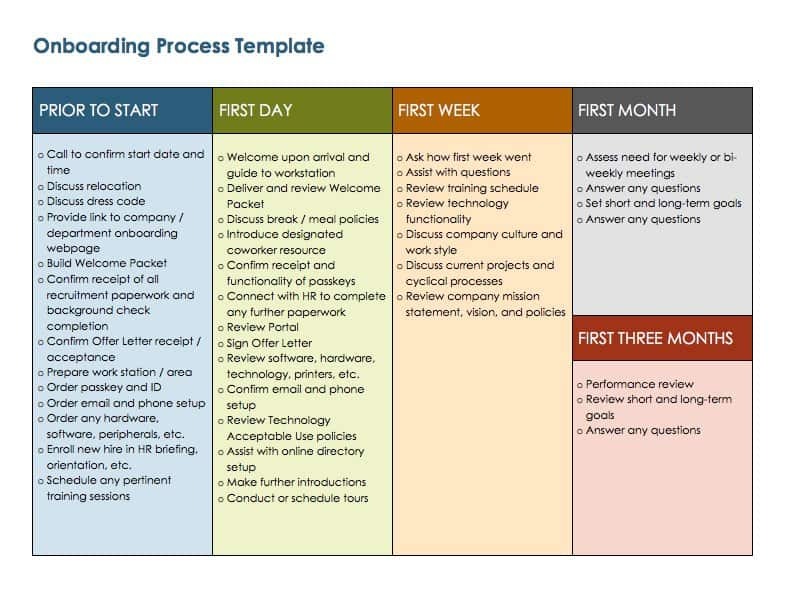 This onboarding process template provides a simple guide to the typical onboarding stages, from pre-boarding to the final measurements of success. You can use this template to create your own list of onboarding best practices, use it as an HR reference tool, or include it in a presentation. It can also be used as a guideline for creating your own checklist template. Onboarding is not just for new employees: it can also be used when taking on new clients. Teams can use onboarding to ensure that everyone is on the same page about the services being provided and goals to be accomplished, and follow up with clients about their experience. 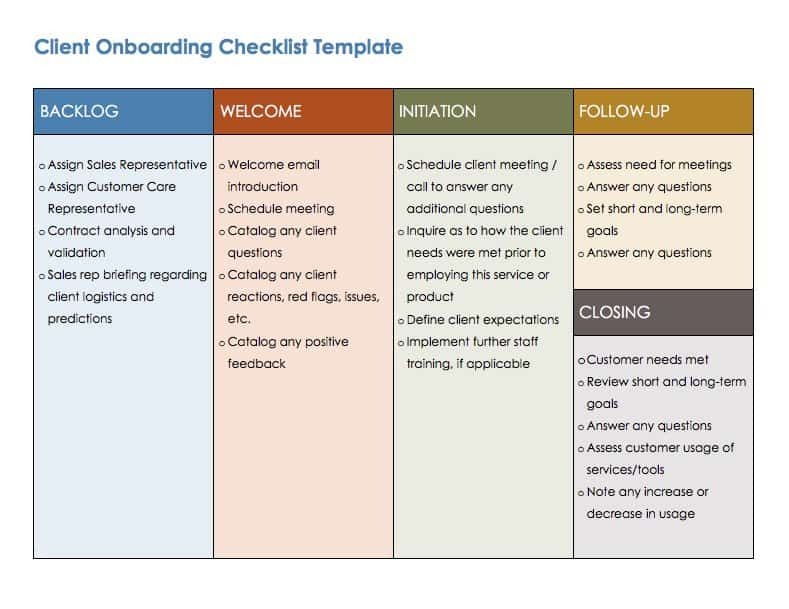 A customer onboarding checklist provides structure for this process, identifying what steps should be taken during each phase of working with a new client. This template provides the format for an informal offer letter, which can be customized to include information pertinent to your company and the position being offered. A formal offer letter goes into greater detail about compensation, benefits, and policies and procedures, while an informal letter merely highlights some of these details. It’s not unusual for a job offer to be sent via email. You can use this template to construct a job offer message that is both welcoming and professional. Like the informal offer letter above, this email template provides just a few essential details about the job and serves as the initial contact after the recruitment and interview stages. As you bring on new hires, former staff members may be transitioning to jobs at other companies, and you may be tasked with providing references. This sample letter of recommendation can be used to quickly create a reference letter, helping you save time while maintaining positive employee relations. An announcement email briefly introduces coworkers to a new employee who will soon be joining them. Sending out an announcement supports the onboarding process by creating a welcoming environment for new hires so that they quickly feel at home and connected to their team and other networks. This welcome letter communicates to new employees that they are joining a sociable organization that is excited about what they have to offer. This letter may be accompanied by additional resources to help jumpstart the rest of the orientation and onboarding process. Simply adjust the text in the welcome letter template to reflect your business culture and the new employee’s role. Finding the right template to track and manage your new employee onboarding can help you get started. But, because onboarding processes are nuanced, and one misstep can result in a poor experience for your new team member, it’s important to have the right solution in place to stay on top of all the details. Streamline your employee performance review process with free templates in Excel and Word.